Pir Vilayat’s retreat process was modeled on the ancient alchemical process of transmuting lead into gold, but here it is the human heart, which, purified of its dross, reflects the divine luminosity. Often a few words, a single idea, can prove the catalyst which moves this process from one stage to the next.The uses of the Alchemical Wisdom sayings are as wide as one’s imagination. Use them as daily meditations, as reflections of your soul’s purpose, as guidance in a situation. Quintessence: A quaility in its universal significance. 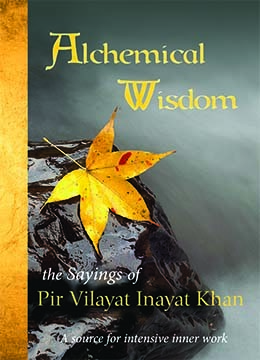 As Pir Vilayat reminds us: Every moment is the chance of a lifetime.